Are You Asking This Question When a Patient Calls To Cancel Their Appointment? Your patient has an appointment booked in today. The appointment has been confirmed and your patient and their /treatment has been discussed at the morning team huddle. Your patient now calls to cancel their appointment. Does your front office team ask your patient the why they need to cancel their appointment? I am sure many of your patients are being asked why they are cancelling their appointment. But this is usually what happens next. Your front office team ask for the cancellation reason, record the reason in their dental software or on a cancellation list and then reschedule the appointment or don’t make the patient another appointment. Your front office team now believe their job has been done and they have followed the cancellation procedure. Your patient goes onto a cancelled appointment list to be followed up to make another appointment when there is time to make these calls. This is happening because this is what most front office teams are instructed to do. Your patient calls to cancel their appointment. Your front office team finds out who is calling and they look up your patient’s file/chart immediately then they ask the reason for the cancellation. Once the cancellation reason is known, your team now look for a solution to keep your patient in their appointment. Now I know this is not always possible, depending on the cancellation reason, but if you look for a solution then offer a solution to your patient, you give your patient the opportunity to change their mind and keep their appointment. Every patient who calls to cancel their appointment should be offered this rather than immediately and automatically moving the patient’s appointment or adding the patients name to a cancellation list. You have helped your patient by keeping them in their appointment and having necessary and often vital dental treatment and care. You reduce your workload by not having to either find a patient to move into this available appointment or follow up your patient to make a new appointment. 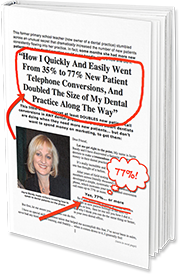 Once you consistently ask your patients why they need to cancel their appointment and then take the next step by looking for a solution so your patient can keep their appointment, you will really be helping your patients and your dental business. You also start to change the mindset of your patients who will believe and know that once they make an appointment they will also keep their appointment.